30 gal. 60 gal. 250 gal. Stanadyne is the only fuel injection system manufacturer in the world to market its own range of diesel fuel additives that are specially formulated for low sulfur fuels. Stanadyne diesel fuel additive is the only independent diesel fuel additive brand tested and approved by many of the world's leading engine and vehicle manufacturers. Experts in diesel servicing recommend Stanadyne diesel fuel additives. In addition, independent testing has shown that using Stanadyne's Performance Formula will increase fuel economy and power while extending the life of your diesel fuel injection system. We not only recommend Stanadyne diesel fuel additives to our customers, but we also use it in our own personal vehicles EVERY time we fill our tanks. 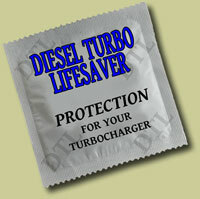 Think of it as "protection" for your turbocharger! When you shut your turbocharged engine off immediately without allowing it to cool down first, then oil is allowed to sit uncirculated directly on the hot turbocharger shaft and bearings. This oil cooks into a carbon coating on the heated components. Eventually this carbon coating will build up and cause the turbocharger bearings to seize. This results in turbo failure and potential engine damage. This can easily be solved by installing a Diesel Turbo Lifesaver (DTLS). Once the DTLS is installed, you don't have to do anything. You simply turn off the ignition switch, remove the key and get out of your vehicle as you normally would. The DTLS takes over and automatically idles your engine and then shuts it off once a safe turbo shut-down temperature has been reached. Additionally, Diesel Turbo Lifesaver features a built in SECURITY features to safeguard your vehicle and can also be used as a PRE-LUBER (most vehicles) to maximize the life of your turbocharger and engine. ALL BRITE BOXES - 10% OFF! The BRITE BOX is a self contained device that greatly contributes to driving safety on dark roads by improving both the output and coverage of standard vehicle headlights. The Brite Box illuminates the low beams (and fog lights with Fog Light Control models) when the high beams are activated which allows 100% of the lighting potential of the vehicle to be utilized. Brite Box provides an even carpet of light that stretches from near to far. Safety and comfort are improved because the driver can now see a larger portion of the road. The safety benefits and circuitry of Brite Box has been proven in millions of miles of over the road testing, and is used by law enforcement and transportation companies. Brite Box features easy plug in installation (in most vehicles) and can usually be installed in 30 minutes or less. There are Brite Box models available to fit most domestic cars, light trucks, and sport utility vehicles (SUV's) manufactured from 1976 up. We only have the most common units listed online at this time. If you don't see one for your vehicle, then please call us at (800) 823-4444. Fia Winterfronts - Warm your rig up quicker this Fall! We have Winterfronts available for many light trucks and sport utility vehicles (SUV's). We only have the most popular ones listed online at this time, so if you don't see a Winterfront for your vehicle, then please call us at (800) 823-4444.